Indonesia remains one of our favourite destinations for a short escape, and this time, we decided to fly to Jakarta. The last time we were in Jakarta was more than 5 years ago, and having spent only half a day in town in the wrong places (Ancol and Gandaria City Mall), i can’t say i have actually been to Jakarta. Because we booked the flights rather late (less than 7 weeks away), budget flights were not budget friendly at all (it normally cost S$80 or less), and i ended up getting a flight on Malaysia Airlines for S$93 from CheapTickets. It does mean i have to transit in KL, adding 2.5 hours to the overall travel time, but i still feel better, paying more or less what a budget flight would have cost, but getting a non-budget flight instead. I’m rather impressed with CheapTickets by the way, as i’ve managed to book flights through them, more than once, for which i was prevented from completing the booking process on the official carrier websites, due to strange constraints or bugs on those websites. So what can one do in Jakarta in a span of 3.5 days? Not much unfortunately. Try as i might, i couldn’t find enough activities to fill more than 2.5 days. I had suspected that this was going to be the case, and the only solution is to get out of Jakarta. In my case, the logical thing to do is to spend 2 days outside Jakarta. Anyway, i have always been fascinated by the varied landscape in Indonesia, and it would not do my Indonesian trip justice if i merely stayed inside the city. As the driving time in Indonesia are typically very long due to the lack of highways, one cannot venture very far from Jakarta in 2 days. 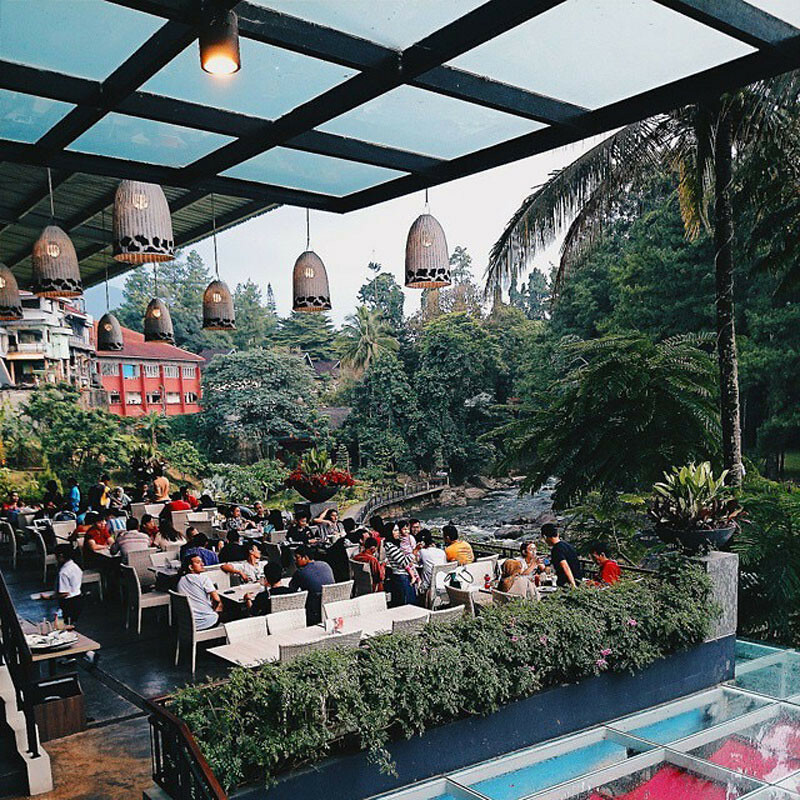 When i looked up places to visit around Jakarta, the images that most captured my imagination were those of Situ Gunung (photo above). It is about 3.5 hours away from Jakarta, just about right. Visit the old town (Kota Tua), including Fatahilah Square and Cafe Batavia. Shop and relax at Central Park/Taman Anggrek Mall, possibly having dinner at Sate Khas Senayan, which is almost the only non-international restaurant in the mall. Depart for Taman Safari Indonesia, stopping at Cimory Riverside restaurant for lunch on the way. Visit Gunung Mas tea plantation before proceeding to Sukabumi. Bubur Ayam Buntu (chicken porridge) is the signature dish from Sukabumi, so that’s the obvious choice for dinner. Visit Situ Gunung lake and Curug Sawer waterfall, both within the same National Park. Lunch at Ah Poong floating market restaurant, followed by shopping at Raja Factory Outlet. Make the way back to Jakarta and visit Grand Indonesia, possibly the grandest shopping mall in all of Indonesia. Dinner at Kafe Betawi. Cap the day with chill time at Skye rooftop bar. The itinerary for the final day will be decided on the day itself, either visiting Taman Mini theme park or Kidzania at Pacific Place, more likely be the latter. I guess the bottom line is, if you hire a car (with driver), there is much to do and see (and eat!) in Indonesia.